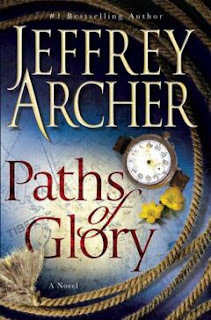 Paths of Glory by Jeffrey Archer is based on a true story. It is the story of George Mallory who dreamed of conquering the Everest and perished on his third attempt. On searching about it in Google, I found that his body was found in 1999, and it still remains a mystery whether he ever reached the summit. He was last seen six hundred feet from the top. Some people have dreams that are so magnificent that if they were to achieve them, their place in history would be guaranteed. Francis Drake, Robert Scott, Charles Lindbergh, Amy Johnson, Edmund Hilary, Neil Armstrong, and Lewis and Clark are among such individuals. But what if one man had such a dream, and once he’d fulfilled it, there was no proof that he had achieved his ambition? Paths of Glory, is the story of such a man. But only after you’ve turned the last page of this extraordinary novel, inspired by a true story, will you be able to decide if George Mallory’s name should be added to the list of legends, in which case another name would have to be removed. The book summary speaks pretty much a lot about the content of the book. The cover page of the book also said, 'He loved two women and the second one killed him'. That was intriguing at first, but soon I figured out who this second lady was. The book starts with George Mallory and how even as a kid, he showed his natural talent for climbing. He is married to the love of his life and is blessed with two daughters and a son. After his education is finished he takes up a job as a school master. But his passion for climbing never dims or dies. The novel also touches on the horrors of World War I and how life of common people were affected by it. What, I liked about the novel was the love Mallory had for his wife and how they wrote letters to each other when Mallory was off to his Everest expeditions. In fact, a good part of the novel is told in the letters they write to each other. But, in the end Mt. Everest proved to be tough lady to please and whether Mallory reached the top or not remained a mystery and a controversy. But, in the end, Archer made clear what he felt the truth was. The writing style is average and Mallory is portrayed as a hero throughout even though there are other fellow climbers who seem quite good. There are some shallow details about the adversaries of nature on high altitudes, the preparation involved in mountaineering and the perils involved but all that did not make the story more convincing for me. To me it sounded more fictional than real.When you read something involving adventures, it should make you excited as well. This book failed to ignite that excitement. The book is different from all the other books I have read of the author. It is kind of rather slow paced than I would like it to be. I was not amazed or annoyed by it. For me it falls into the average quick read. Oh dear..after reading this I remember the story of the man 1999 news papers back in India. Your write-up is a temptation for me to read the book. I will let you know how it hit me.. This one just has no draw for me. Doesn't sound like I'm missing too much by not reading it. Ive read the book, but I found your summary much more interesting than the book itself. When we pick up a Jeffery Archer book we expect it to be thrillingly un-put-down-able, but this was a big drag for me. @ Deepa: Thanks.. Will look forward to what u think abt the book..
@ Pooja: I agree with u abt the notion on Archer's book.. Thats why I siad it different from all his books. It was a bit drag for me too.. This does not appeal to me but I might look out for it for my husband, so thanks for the review Jyoti. I vaguely remember staring this book a long time back (to promptly abandon it )..
Must be an enjoyable read Paths of Glory by Jeffrey Archer. loved the way you wrote it. I find your review very genuine and original, this book is going in by "to read" list.